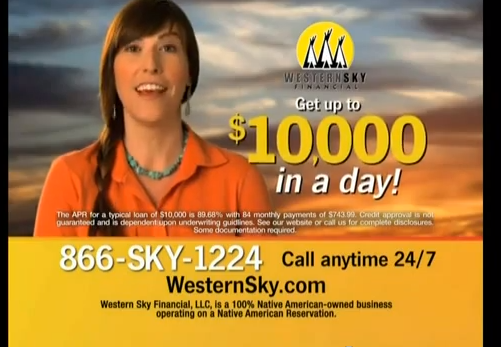 If you’ve watched daytime TV in recent years, you’ve more than likely seen ads for Western Sky Financial a payday lender operating out of a tribal reservation in South Dakota. Facing lawsuits from around the country and increased scrutiny from regulators over triple-digit interest rates for its short-term loans, the company has announced it will stop funding new loans on Sept. 3. This news came out last night after Western Sky posted a declaration on its website that it will cease funding loans starting next week. “This action by out-of-state regulators has forced us to lay off nearly all of our employees and suspend our operations,” a rep for the lender tells the Wall Street Journal. Western Sky, which is owned by a member of the Cheyenne River Sioux tribe, is one of a handful of payday operations that claim they are not bound by state law because they operate on tribal reservations. This stance allowed, at least in theory, for Western Sky to make loans to consumers in states where payday loans are effectively outlawed by usury caps. For example, the state of New York caps loan interest rates at 25%, but some New Yorkers were able to obtain short-term loans from Western Sky with effective APRs or around 355%. This led the state’s attorney general, Eric Schneiderman, to sue the company earlier this year. The lender was also one of 35 online lenders operating on reservations that recently received cease-and-desist notices from New York state banking regulators. And New York is not the only one that has sued Western Sky. Authorities in Oregon, Colorado, Minnesota, and Maryland have all sued the company over similar complaints. The payday lending industry is waiting nervously to see what the federal Consumer Financial Protection Bureau, which recently gained oversight over short-term and storefront lenders, will do to rein in the controversial practice. The CFPB’s report from April of this year found that payday loans, while intended to be a short-term solution for low-income individuals, tends to catch borrowers in a cycle of debt. According to the CFPB’s findings, the average payday borrower spends half the year in debt to his lender, taking out around 10 loans during that time, often just to pay off the previous loan.